Тринадцатая поправка к Конституции США была принята Конгрессом во время Гражданской войны в США, 31 января 1865 года, ратифицирована необходимым количеством штатов 6 декабря 1865 года, вступила в силу 18 декабря 1865 года. Тринадцатая поправка запрещала рабство и принудительный труд, кроме наказания за преступление. В том числе был изменён и раздел 2 статьи IV, которым ранее запрещалось содействовать побегу рабов. С последней 12-й поправки, принятой в 1804 году, прошло более 60 лет. Интересно, что поправка была ратифицирована 27 штатами в течение 1865 года, чего было достаточно для её принятия, однако некоторые штаты ратифицировали поправку более 100 лет спустя: так, в штате Кентукки поправка была ратифицирована лишь в 1976 году (в 1865 году в Кентукки ратификация не прошла), а Миссисипи — в 1995 году. Ратификация штатом Миссисипи в 1995 году не была официально подана Архивисту США по неизвестным причинам. Ратификация была направлена в Федеральный реестр США 30 января 2013 года, а 7 февраля 2013 года директор Федерального реестра подтвердил получение документа и что он был официальным. Раздел 1. В Соединённых Штатах или в каком-либо месте, подчиненном их юрисдикции, не должно существовать ни рабство, ни подневольное услужение, кроме тех случаев, когда это является наказанием за преступление, за которое лицо было надлежащим образом осуждено. Раздел 2. Конгресс имеет право исполнять настоящую статью путём принятия соответствующего законодательства. ↑ Mount, Steve Ratification of Constitutional Amendments (неопр.) (January 2007). Дата обращения 24 февраля 2007. Архивировано 21 января 2013 года. ↑ Mitchell, Jerry. Historic oversight in Mississippi corrected, Clarion Ledger. Дата обращения 17 февраля 2013. ↑ В штате Миссисипи отменили рабство (19 февраля 2013). Дата обращения 20 февраля 2013. 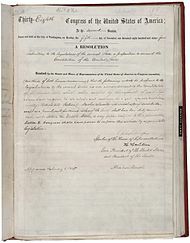 ↑ 13th Amendment | U.S. Constitution | LII / Legal Information Institute (неопр.). Law.cornell.edu (20 ноября 2012). Дата обращения 30 ноября 2012. Архивировано 21 января 2013 года. Belz, Herman. Emancipation and Equal Rights: Politics and Constitutionalism in the Civil War Era. — New York : W. W. Norton, 1978. Preview. Benedict, Michael L. (2011). “Constitutional Politics, Constitutional Law, and the Thirteenth Amendment”. Maryland Law Review. University of Maryland School of Law. 71 (1): 163—188. Pdf. Blackmon, Douglas A. Slavery by Another Name: The Re-Enslavement of Black Americans from the Civil War to World War II. — Knopf Doubleday Publishing Group, March 25, 2008. — ISBN 9780385506250. Preview. Colbert, Douglas L. (Winter 1995). “Liberating the Thirteenth Amendment”. Harvard Civil Rights-Civil Liberties Law Review. Harvard Law School. 30 (1): 1—55. Cramer, Clayton E. Black Demographic Data, 1790–1860: A Sourcebook. — Greenwood Publishing Group, 1997. — ISBN 9780313302435. Donald, David Herbert. Lincoln. — Simon & Schuster, 1996. — ISBN 9780684825359. Preview. Du Bois, W.E.B. Black Reconstruction: An Essay Toward a History of the Part Which Black Folk Played in the Attempt to Reconstruct Democracy in America, 1860–1880'. — New York: Russell & Russell, 1935. Foner, Eric. The Fiery Trial: Abraham Lincoln and American Slavery. — W. W. Norton, 2010. — ISBN 9780393066180. Preview. Goluboff, Risa L. (April 2001). “The Thirteenth Amendment and the lost origins of civil rights”. Duke Law Journal. Duke University School of Law. 50 (6): 1609—1685. DOI:10.2307/1373044. JSTOR 1373044. Pdf. Goldstone, Lawrence. Inherently Unequal: The Betrayal of Equal Rights by the Supreme Court, 1865–1903. — Walker & Company, 2011. — ISBN 9780802717924. Preview. Goodwin, Doris Kearns. Team of rivals: the political genius of Abraham Lincoln. — Simon & Schuster, 2005. — ISBN 9780743270755. Preview. Harrison, John (Spring 2001). “The lawfulness of the reconstruction amendments”. University of Chicago Law Review. University of Chicago Law School. 68 (2): 375—462. DOI:10.2307/1600377. JSTOR 1600377. Kachun, Mitch. Festivals of Freedom: Memory and Meaning in African American Emancipation Celebrations, 1808–1915. — 2003. Online. McAward, Jennifer Mason (2010). “The scope of Congress's Thirteenth Amendment enforcement power after City of Boerne v. Flores”. Washington University Law Review. Washington University School of Law. 88 (1): 77—147. Pdf. Response to McAward: Tsesis, Alexander (2011). “Congressional authority to interpret the Thirteenth Amendment”. Maryland Law Review. University of Maryland School of Law. 71 (1): 40—59. SSRN 1753224. Pdf. McAward, Jennifer Mason (2011). “Congressional authority to interpret the Thirteenth Amendment: a response to Professor Tsesis”. Maryland Law Review. University of Maryland School of Law. 71 (1): 60—82. SSRN 2271791. Pdf. McConnell, Joyce E. (Spring 1992). “Beyond metaphor: battered women, involuntary servitude and the Thirteenth Amendment”. Yale Journal of Law and Feminism. Yale Law School. 4 (2): 207—253. Pdf. McPherson, James M. Battle Cry of Freedom: The Civil War Era. — Oxford University Press, 1988. — ISBN 9780195038637. Preview. Novak, Daniel A. The Wheel of Servitude: Black Forced Labor after Slavery. — Kentucky : University Press of Kentucky, 1978. — ISBN 0813113717. Richards, Leonard L. Who Freed the Slaves? : The Fight over the Thirteenth Amendment. — 2015. Excerpt. Emphasis on the role of Congressman James Ashley. Stanley, Amy Dru (June 2010). “Instead of waiting for the Thirteenth Amendment: the war power, slave marriage, and inviolate human rights”. The American Historical Review. Oxford Journals for the American Historical Association. 115 (3): 732—765. DOI:10.1086/ahr.115.3.732. JSTOR 10.1086/ahr.115.3.732. Pdf. Stromberg, Joseph R. (Spring 2002). “A plain folk perspective on reconstruction, state-building, ideology, and economic spoils”. Journal of Libertarian Studies. Center for Libertarian Studies, Ludwig von Mises Institute. 16 (2): 103—137. Pdf. tenBroek, Jacobus (June 1951). “Thirteenth Amendment to the Constitution of the United States: Consummation to Abolition and Key to the Fourteenth Amendment”. California Law Review. California Law Review, Inc. via JSTOR. 39 (2): 171—203. DOI:10.2307/3478033. JSTOR 3478033. Pdf. Thorpe, Francis Newton The Constitutional History of the United States, vol. 3: 1861 – 1895 (неопр.) (1901). Trelease, Allen W. White Terror: The Ku Klux Klan Conspiracy and Southern Reconstruction. — New York : Harper & Row, 1971. Tsesis, Alexander. The Thirteenth Amendment and American freedom: a legal history. — New York : New York University Press, 2004. — ISBN 0814782760. Vicino, Thomas J. Global Migration The Basics / Thomas J. Vicino, Bernadette Hanlon. — Routledge, 2014. — ISBN 9781134696871. Vorenberg, Michael. Final freedom: the Civil War, the abolition of slavery, and the Thirteenth Amendment. — Cambridge : Cambridge University Press, 2001. — ISBN 9781139428002. Preview. Barrington Wolff, Tobias (May 2002). “The Thirteenth Amendment and Slavery in the Global Economy”. Columbia Law Review. Columbia Law School. 102 (4): 973—1050. DOI:10.2307/1123649. JSTOR 1123649. Garber, Mark A. (2011). “Foreword: Plus or minus one: the Thirteenth and Fourteenth Amendments”. Maryland Law Review. University of Maryland School of Law. 71 (1): 12—20. Pdf. Carter Jr., William M. (2011). “The Thirteenth Amendment, interest convergence, and the badges and incidents of slavery”. Maryland Law Review. University of Maryland School of Law. 71 (1): 21—39. SSRN 1932762. Pdf. Tsesis, Alexander (2011). “Congressional authority to interpret the Thirteenth Amendment”. Maryland Law Review. University of Maryland School of Law. 71 (1): 40—59. SSRN 1753224. Pdf. McClain, Linda C. (2011). “Involuntary servitude, public accommodations laws, and the legacy of Heart of Atlanta Motel, Inc. v. United States”. Maryland Law Review. University of Maryland School of Law. 71 (1): 83—162. SSRN 2188939. Pdf. Benedict, Michael Les (2011). “Constitutional politics, constitutional law, and the Thirteenth Amendment”. Maryland Law Review. University of Maryland School of Law. 71 (1): 163—188. Pdf. Pope, James Gray (2011). “What's different about the Thirteenth Amendment, and why does it matter?”. Maryland Law Review. University of Maryland School of Law. 71 (1): 189—202. SSRN 1894965. Pdf. Novkov, Julie (2011). “The Thirteenth Amendment and the meaning of familial bonds”. Maryland Law Review. University of Maryland School of Law. 71 (1): 203—228. Pdf. Kersch, Ken I. (2011). “Beyond originalism: conservative declarationism and constitutional redemption”. Maryland Law Review. University of Maryland School of Law. 71 (1): 229—282. Zietlow, Rebecca E. I. (2011). “Conclusion: the political Thirteenth Amendment”. Maryland Law Review. University of Maryland School of Law. 71 (1): 283—294. SSRN 2000929. Pdf. Tsesis, Alexander (November 2012). “Into the light of day: relevance of the Thirteenth Amendment to contemporary law”. Columbia Law Review. Columbia Law School. 112 (7): 1447—1458. JSTOR 41708155. Архивировано из оригинала 2015-11-17. Pdf. Balkin, Jack M.; Levinson, Sanford (November 2012). “The dangerous Thirteenth Amendment”. Columbia Law Review. Columbia Law School. 112 (7): 1459—1499. JSTOR 41708156. Архивировано из оригинала 2015-11-17. Pdf. Graber, Mark A. (November 2012). “Subtraction by addition? : The Thirteenth and Fourteenth Amendments”. Columbia Law Review. Columbia Law School. 112 (7): 1501—1549. JSTOR 41708157. Архивировано из оригинала 2015-11-17. Pdf. Rutherglen, George (November 2012). “The Thirteenth Amendment, the power of Congress, and the shifting sources of civil rights law”. Columbia Law Review. Columbia Law School. 112 (7): 1551—1584. JSTOR 41708158. Архивировано из оригинала 2015-11-17. Foner, Eric (November 2012). “The Supreme Court and the history of reconstruction – and vice-versa”. Columbia Law Review. Columbia Law School. 112 (7): 1585—1606. JSTOR 41708159. Архивировано из оригинала 2015-11-17. Pdf. Soifer, Aviam (November 2012). “Federal protection, paternalism, and the virtually forgotten prohibition of voluntary peonage”. Columbia Law Review. Columbia Law School. 112 (7): 1607—1639. JSTOR 41708160. Архивировано из оригинала 2015-11-17. Pdf. Tsesis, Alexander (November 2012). “Gender discrimination and the Thirteenth Amendment”. Columbia Law Review. Columbia Law School. 112 (7): 1641—1695. JSTOR 41708161. Архивировано из оригинала November 28, 2014. Pdf. Zietlow, Rebecca E. (November 2012). “James Ashley's Thirteenth Amendment”. Columbia Law Review. Columbia Law School. 112 (7): 1697—1731. JSTOR 41708162. Архивировано из оригинала 2015-11-17. Pdf. Greene, Jamal (Nov 2012). “Thirteenth Amendment optimism”. Columbia Law Review. Columbia Law School. 112 (7): 1733—1768. JSTOR 41708163. Архивировано из оригинала 2015-01-07. Pdf. Carter, Jr., William M. (November 2012). “The Thirteenth Amendment and pro-equality speech”. Columbia Law Review. Columbia Law School. 112 (7): 1855—1881. JSTOR 41708166. SSRN 2166859. Pdf. Delgado, Richard (November 2012). “Four reservations on civil rights reasoning by analogy: the case of Latinos and other Nonblack groups”. Columbia Law Review. Columbia Law School. 112 (7): 1883—1915. JSTOR 41708167. Архивировано из оригинала 2013-01-15. Pdf.